Time to learn the tough partial barre F chord! Jessica covers many of the basics needed to help train your fingers for the shapes needed to complete partial barre chords. Hi Jess your teaching is so nice and easy to understand capture. I can play this stuff, but it's fun to watch Jessica teach. She's so nice to listen to. Trying to learn to play the F chord and I found your lesson. Awesome, thanks. I'll be going back in the lesson series to learn more of the theory you were mentioning. Jessica Baron, founder of Guitars in the Classroom, brings her very own unique series to JamPlay. In this highly interactive, easy to follow set, Jessica invites students of all ages to journey through fun, song-based instruction taught in ways she feels we best learn. Jessica takes a moment to share a breathing technique. Then, she asks you to envision who you want to be as a musician. In this lesson, Jessica starts talking about the first building block of making music: rhythm. Using yourself as a drum, you will feel the beat and find the rhythm within yourself. Jessica takes some time to talk about finding the right guitar for you. She explores different sizes and talks about the correct and most comfortable sitting position. Jessica Baron discusses "Gentle G Guitar" and explains why it is such a great learning method for beginners. In this lesson, Jessica Baron explains how to tune your guitar to open G with or without an electronic tuner. In this lesson, Jessica Baron shows how to string a steel string guitar. In part 2 of Jessica Baron's restringing lessons, you will learn how to string your classical guitar, which is a little different from a steel string. Jessica Baron delights in sharing a fun lesson that is all about ear training and singing in tune. Jessica Baron shares some fun and effective vocal exercises to get you warmed up before singing. This is very important for those of you who would like to sing while playing. Jessica Baron shares part 2 of her vocal warm-up lessons with some fun new exercises to prepare you for singing. In lesson 13, Jessica Baron introduces you to strumming technique. Jessica Baron introduces your first easy chord, Gsus4. Jessica Baron talks about patterns and chord charts. She also provides more exercises for the C note you learned in the previous lesson. Jessica Baron introduces a new chord she calls the "Simple D" and provides a song exercise for practice. Jessica Baron teaches techniques in the context of "The Old Chisholm Trail." Learn about the pluck-down strum, practice changing from "Open G "to "Simple D," and learn about capos. Jessica introduces the "Simple C" chord and incorporates it into two fun songs, "Camptown Races" and "The Green Grass Grows All Around." Jessica takes some time to show you a variety of different strums to use in your playing. She teaches the song "I'll Fly Away" to demonstrate the different feel of each strum. Jessica Baron teaches the C major chord using only 2 fingers and provides some fun song exercises for practice. Jessica Baron introduces your first minor chord! Learn the beautiful E minor chord and play along to "This Little Light of Mine." In this lesson, Jessica Baron provides some good, fun practice using a traditional Native American chant called "The Earth Is Our Mother." Jessica Baron explains time signatures with a focus on 3/4 time. She uses fun and interactive song exercises for practice. Jessica Baron teaches one final song in open G tuning called "I'm on My Way" before moving on to standard tuning. 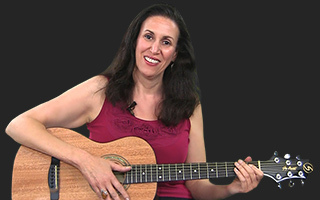 Jessica Baron introduces standard tuning in this lesson! Be ready to tune your guitar and learn "You've Got to Move" for practice. Jessica Baron introduces the A minor chord in standard tuning and invites you to play along to the fun song "Drunken Sailor." Jessica Baron introduces the A major chord in standard tuning. Practice it with the catchy song "A Tisket, A Tasket." Jessica Baron teaches the D major chord and "Down By The Riverside" for practice. Jessica Baron is excited to provide more practice changing from D to A7 with the fun song, "Over the River and Through the Woods." Jessica Baron teaches a new chord, B7, with "The Crawdad Song" for practice. Jessica Baron helps you play the full G major chord by using the song, "I've Been Working on the Railroad." Jessica Baron is excited to finally teach the full C major chord with the bluesy song "Sometimes I Feel Like a Motherless Child" for practice. Jessica Baron takes all the knowledge you've learned throughout her series and helps you express yourself through your own compositions. Jessica Baron continues her discussion on composition with a songwriting exercise. In addition, she also takes a closer look at finger picking with one last picking pattern. This lesson is essentially a compressed version of Jessica's 35th lesson, but presented in a way that will allow you to prep yourself using "Yoga for Guitar Players" within about 90 seconds. Proper positioning of the fret hand is key to developing correct technique and playing clean and clear chords. Jessica explains how the angle at which the guitar neck is positioned affects left hand technique. Jessica starts a mini series on understanding chords by explaining how and where to find the notes needed to build a certain chord. Understanding Chords: Where's the Root Note? Jessica continues her "Understanding Chords" mini series by explaining how to find the root note within commonly used chord shapes. Understanding Chords: What Is Voicing? This lesson will link all the past lesson content into one by helping you understand how to find alternate voicings of chords on the guitar neck. Using the song "Down by the River to Pray," Jessica explains what the Nashville Number System is and how it is used to quickly learn a new song. What are 7th chords? 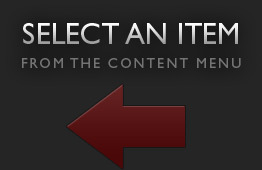 How and where can they be used? Jessica answers these questions and demonstrates some popular 7th chord shapes. Using the song "Mole in the Ground," Jessica applies the Nashville number system and demonstrates how to create new, unique lyrics that compliment your chord progression. Utilizing Major 7th chords and a song called "The Ashgrove", Jessica will demonstrate some great tips on how to chose the right accent chord to spice up your playing. Jessica will demonstrate how to add a Sus 4 to a chord to change its tone. This can be used to spice up and get creative with standard chord positions. Jessica discusses the difference in tone between playing with the pick and playing with the fingers. Jessica now presents the option of adding bass runs while utilizing the fingers to pluck and strum the strings. Jessica taps into a mini-series that demonstrates how to navigate tricky chord changes. This first lesson focuses on the F chord. Jessica continues to demonstrate tricky chord changes by moving on to the B minor chord. Jessica demonstrates how easy it is to play a full I, IV, V song by only moving the familiar E major chord shape up and down the fretboard. A lot of the techniques Jessica shows in this lesson can be applied within any genre of music. However, she demonstrates hammer-on and pull-off techniques and how they are applied within blues. Jessica now dives into fingerstyle techniques, specifically Travis picking. Jessica now works on picking hand techniques. She starts with the basics of using 3 fingers to create arpeggio patterns. Still working within finger picking techniques, Jessica now demonstrates how to navigate more chord changes while still keeping a steady picking rhythm. Jessica continues her 6/8 fingerpicking techniques by adding yet another step in the full picking progression. However, she will still utilizes the same song from the previous lesson. Demonstrating yet another widely popular fingerstyle picking technique called Travis Picking, Jessica breaks down this technique and applies it to a very catchy song that is easy to play. It's time to apply the techniques that have been taught so far to understanding and creating a song arrangement. In this lesson, Jessica discusses how to create a song beginning and ending. It's now time to learn some creative tips on how to spice up how songs are arranged. Jessica gives pointers on both singing and playing along the lines of improvisation and tempo alternations. Still within the topic of song arrangement, Jessica now delves into Travis picking and how it can be applied in a creative manner to compliment other techniques that Jessica has already taught. Jessica creates a song in front of your eyes. She guides you through the steps from starting with a catchy riff or progression to developing a full song idea. Jessica lays out a great tutorial on how to listen to chords and the emotions they evoke. This technique can easily help transform an atmosphere or mood into a full song with lyrics. Jessica demonstrates how you can combine the discovery of writing a song with chords and the playfulness of creating possible lyrics over those chords. Let your mind run free with this subject! Jessica believes in making your introduction to the guitar easy and pain-free. She is a developmental educator who understands how positive early experiences can motivate us to keep learning. Jessica Baron founded and serves as Executive Director for Guitars in the Classroom, an organization that brings music making to education by integrating singing, strumming and songwriting with learning throughout the school day and across the curriculum. Jessica created the first developmental guitar instruction method and she has written six groundbreaking books in the field of music and guitar education. She believes that we are each unique musical and creative beings with individual pathways we can choose to discover and follow if we are given instruction in the ways we best learn. This vision informs and fuels her dedication to service through teaching. Jess spent several years in California teaching music in public and private schools; she also worked for a long time as both a human development educator (at Crossroads School of Arts and Sciences) and as a private educational therapist treating children and teens with learning disabilities. These experiences, combined with Masters level training in Clinical Psychology from Antioch University helped her develop an approach to teaching music that creates access to musicality through people’s dominant learning styles while helping them strengthen the others. This, combined with her philosophy that musical learning can be fun and stress free, define her work as an author, teacher, and non-profit leader. In addition to her years teaching in the classroom and counseling young people, Jess co-authored the highly successful MusicMakers curriculum for the Boys and Girls Clubs of America, as well as the International House of Blues Foundation’s Make an Impression guitar program. Her best-selling guitar method, SmartStart Guitar as well as her parenting book, YOUR MUSICAL CHILD: Inspiring Kids to Play and Sing for Keeps (Hal Leonard, 2004) are soon to be followed by The Green Songbook & CD from Alfred Music Publishing. This compilation of music for living lightly on the Earth is now available at www.greensongbook.com. Jess lives in Encinitas with her teen-age son, Elias, their three birds, two lizards, and one ridiculously adorable dog named Homer. You might have known Jess by her published and formerly married name, Jessica Baron Turner, a last name she went by during her marriage to Eli’s dad, luthier, Rick Turner. These days she goes by Jessica Anne Baron. Jess is also an incidental songwriter, an enthusiastic gardener, a vegetarian, and lover of literature.